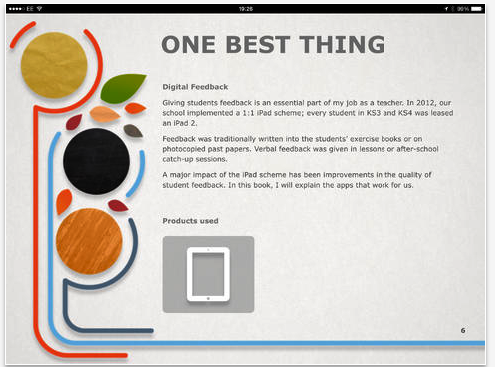 In this short interactive guide, Daniel Toms (One Best Thing team ) walks you through the different ways you can use iPads in your class to provide students with effective digital feedback to improve their learning . Referencing both John Hattie’s popular book Visible Thinking and the Sutton Report, Daniel highlights the importance of digital feedback in students learning stating that it has a huge impact on students progress. He went on to talk about the three iPad apps (namely Showbie, Explain Everything, and Notability) they use at his school for assessment purposes. Daniel demonstrates how you can use each of the three apps mentioned above to gather, record and share feedback with students. He explains the features they provide and how you can use them in your own teaching setting. For more options on apps to use for digital feedback, check out this page. For those of you not familiar with One Best Thing, this is an interesting collection of books authored by different Apple Distinguished Educators (ADEs) to help teachers make an effective use of Apple products in teaching and learning.